The limitations of a liquid diet pose both nutritional and culinary challenges. Fruit and vegetable juices will provide some key vitamins and minerals but are not likely to fill you up for long because they consist primarily of carbohydrate. 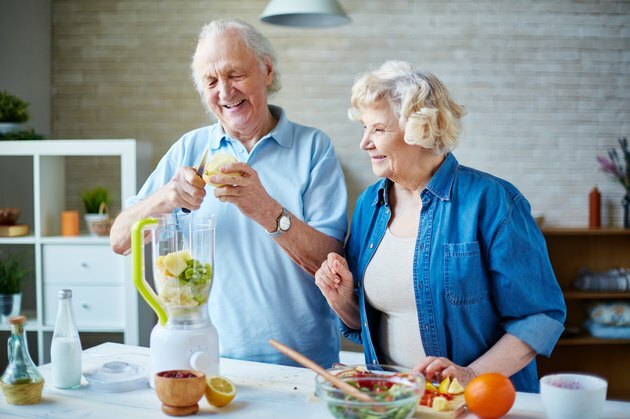 To make liquid meals more filling, include liquid foods rich in protein, fiber or fat, such as avocado, nut butters, beans and dairy or dairy substitutes. Fat, fiber and protein all help keep you full for longer by slowing down digestion. Avocado is rich in healthy and filling unsaturated fat. You can use avocado to make both sweet and savory liquid foods. Blend avocado with milk and cocoa powder or chocolate syrup to make a chocolate shake. Add vanilla extract and sweetener to taste. For something savory, make a simple soup by blending avocado with cooked vegetables, broth, cream or herbs and spices. Look also for more elaborate recipes common to Spanish, Mexican and Southeast Asian cuisines. Regular dairy products are rich in both protein and fat, which can help you feel full even on a liquid diet. Add milk, yogurt or cream to smoothies or soups. If you do not or cannot drink dairy products, look for milk substitutes made from soy, nuts, rice or coconut. The nutritional profile of these beverages are not, however, identical to dairy milk. Rice milk, for example is mostly carbohydrate, while coconut-based milk substitutes are mostly fat. Fruit goes well in smoothies, but you can also use fruit to make soup. Fruit soups tend to be thinner than smoothies and often contain herbs or spices. A pomegranate juice soup, for example, might contain cumin and ginger while a cantaloupe soup might be seasoned with mint. Fruit soups, usually served chilled, are best suited to warmer months, when fresh and flavorful in-season fruit is at its peak. Create endless variety in soups with different vegetables. Most vegetables contain fiber, which helps keep you full for longer. Beans are especially high in fiber and blend easily into creamy soups that you can water down to desired consistency. You can make more filling soups by adding dairy, olive oil or coconut milk. Recipes for pureed soups abound from all over the world. Try cream of tomato, creamy cucumber, Mexican lime, Spanish gazpacho, dilled potato, sweet carrot or pureed white bean. You can also try thin hummus with tomato juice or broth to turn it into a satisfying liquid meal. Nut butters are rich in protein and healthy fat, which helps fill you up. Blend them into sweet smoothies or savory soups. Get beyond peanut butter by experimenting with almond butter, cashew butter, walnut butter or pumpkin seed butter. For nut-based soup recipes, look to the cuisines of India, Southeast Asia and sub-Saharan Africa as well as to recipes created by raw food enthusiasts.